The subcommittee’s 1964 report declared that the technological skills and equipment to reduce air pollution had “passed the research stage” and that there was “no valid reason to delay” adoption of emissions control equipment in newly manufactured automobiles. 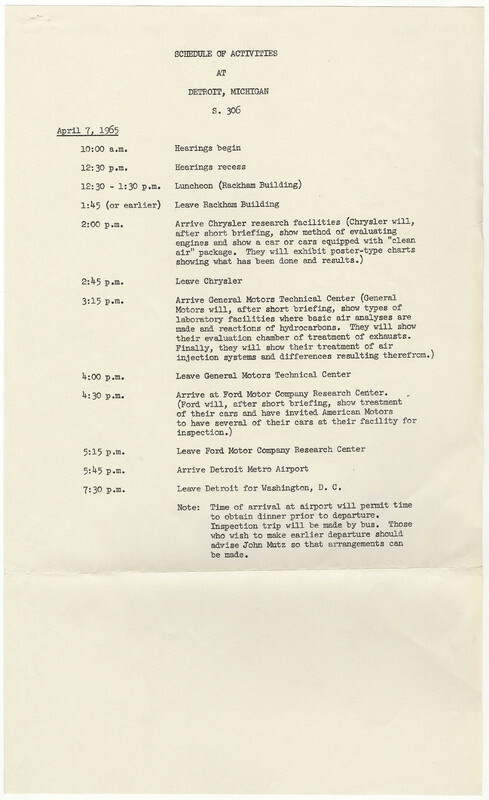 As this Schedule of Events for April 7, 1965 indicates, the subcommittee traveled to Detroit to hear from automobile manufacturers and to visit Chrysler, General Motors, and Ford research facilities. United States. Congress. Senate. Committee on Public Works. "Schedule of Activities at Detroit." Schedule of Activities at Detroit, Michigan S. 306, April 7, 1965, “306 Hearings—Clean Air Act amdts. April 6th & 9th (7th Detroit)” folder, Legislative Files, Box 3; Committee on Public Works; 89th Congress; Records of the U.S. Senate, RG 46; National Archives.. Accessed 19 April 2019. http://acsc.lib.udel.edu/items/show/324. Schedule of Activities at Detroit, Michigan S. 306, April 7, 1965, “306 Hearings—Clean Air Act amdts. April 6th & 9th (7th Detroit)” folder, Legislative Files, Box 3; Committee on Public Works; 89th Congress; Records of the U.S. Senate, RG 46; National Archives.